Fig. 1. Histogram and dot plot representing QuantiBRITE phycoerythrin (PE) beads, a set of four beads conjugated with known levels of PE fluorochrome. These beads are acquired in every experiment and used as a fluorescence standard to convert main fluorescent intensity (MFI) to antibody-binding capacity (ABC). 4. The beads are then incubated with 100 pL anti-BCR mouse monoclonal antibody per 100 pL original bead volume overnight at 4°C with mixing. 5. The beads are centrifuged and washed three times in activation buffer (1 mL/100 pL of original bead volume), then resuspended in blocking buffer (1 mL/100 pL of original bead volume) for 1.5 h at 37°C with mixing. Finally, the beads are centrifuged and resuspended in quenching buffer (1 mL/100 pL of original bead volume) for 30 min at room temperature with mixing. 6. The beads are then centrifuged and washed three times and resuspended in blocking buffer (1 mL/100 pL of original bead volume) (see Note 1; Fig. 2). 1. Plasmas are collected from the peripheral blood of a CML patient and normal individuals. PBS is also used as a negative control. Fig. 2. 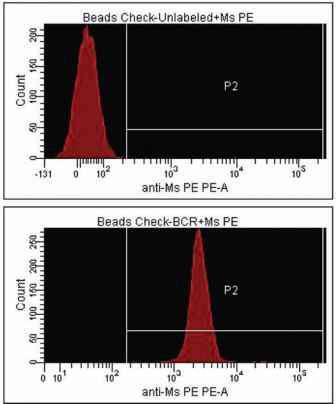 Histograms representing anti-BCR-coated beads before and after incubation with anti-mouse phycoerythrin. This "beads-check" is performed to ensure conjugation has occurred. 2. The plasmas are diluted 1:50 in PBS/2% BSA and denatured in the presence of 2% sodium dodecyl salt at 96°C for 4 min, followed by centrifugation at 17,949g for 2 min at room temperature. 3. The supernatant is incubated with 30 pL anti-BCR conjugated beads at room temperature for 2 h with mixing, followed by washes and resuspension in PBS/2% BSA. 4. Each sample is divided into three equal aliquots and incubated in the presence of 5 pL total ABL, phospho-ABL (Thr735), and phospho ABL Tyr 245 for 1 h at room temperature, respectively. 5. The beads are washed in the cell washer and resuspended in PBS/2% BSA, followed by incubation with 10 pL PE-labeled goat-anti-rabbit antibody for 30 min at room temperature with mixing. 6. The beads are washed and resuspended in 500 pL flow PBS for analysis. 1. The samples are acquired on the FACS Canto using FACsDiva software. Flow cytometry output is in the form of FCS files. 2. Quantitation is based on a fluorescence standard given by QuantiBRITE PE beads (BD). 3. Data is analyzed using Flow-Jo software (TreeStar). An example of the result is shown in Fig. 3. 4. Normal samples are used as baseline for setting of regional markers. Samples are analyzed based on gating according to the normal plasma samples. Positive shifts less than 5% above normal control are considered to be negative for the presence of BCR-ABL protein (see Note 2). The methodology described here offers several advantages over the conventional detection and quantitation of fusion genes formed by chromosome translocations. Fluoresence in situ hybridization analysis is largely limited by the availability of informative cells. PCR-based assays are hindered by amplification bias and difficulties of standardization. Furthermore, the reverse transcription-polymerase chain reaction assay for BCR-ABL mRNA measures the ratio of leukemic cells to normal cells. 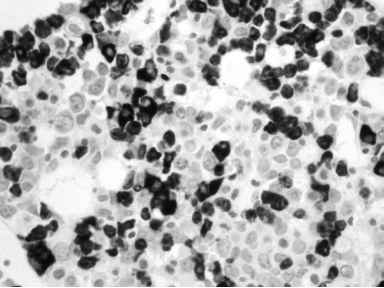 The ratio of hematopoietic cells to normal cells may fluctuate depending on the sample. Western blots assays of BCR-ABL downstream effectors are indirect and may be affected by other intracellular kinases. Western blots also do not discern different cellular populations. Our approach quantitates the BCR-ABL protein itself and its kinase activity, providing the most direct measure of disease activity, progression, and response to treatment. The phosphorylation state of Thr-725 and Tyr-245 residues in the ABL domain indicate the level of BCR-ABL kinase activity. The use of plasma with this approach allows for the direct monitoring of BCR-ABL protein, thereby accounting for the effects of any posttranscriptional regulatory mechanisms on synthesis of BCR-ABL (7,8). This method is adaptable for routine analysis in clinical laboratories and could be applied to the detection of several other oncogenic fusion genes that are caused by chromosome rearrangements.